Want something different for your next birthday party? How about some fun kayaking! 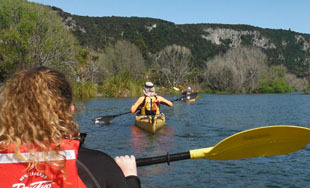 $20 per person, one hour of kayaking in our mission flow or mino kayaks. For children under the age of 12, you must have an adult supervisor on the water. Or a TKA Instructor at $50.00 per hour, ratio of 1:8. Option: While kids are playing, parents can be setting up birthday party on beach. In Acacia Bay – there are public BBQ facilities their too.